April 28, 2004 -- Gary Silah, a long time member and secretary of the club was awarded the coveted Melvin Jones Fellowship by his fellow club members at the club's 30th anniversary dinner held at the Knights of Columbus. Presenting the plaque is District Governor Tom King (Oxford). 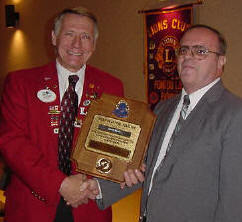 Lion Gary has served as President and numerous years as secretary for the club. He can also be counted on to help out at all the fund raisers. Other Melvin Jones Fellows in the club include, PDG Tom Clausen, Mike Konen, Erv Karls, Tom Bucher, Gary Colton, and Frank Bartzen.